Ashburton Grove - Arsenal news and Arsenal opinion: Arteta relishing opportunity -Wilshere and Vermaelen training -City target Arsenal exec? Arteta relishing opportunity -Wilshere and Vermaelen training -City target Arsenal exec? They say 24 hours is a long time in football and after seeing both the Manchester clubs struggle in their opening Champions League ties, Arsenal's result in Dortmund against the German champions looks a very positive one indeed. I hope the mood in the camp isn't down because it need not be. Yes we conceded a late goal but we battled for 87 minutes prior to Ivan Perisic wonder strike - the likes of which only seem to be scored against us - and have a right to feel proud our our performance. Also we must consider that these players have as a team only had five training sessions together - no time at all which to gel. So whilst the work behind the scenes is going on at the training ground, I think the majority of performances this month are all about scrapping for a result. And that is something which the players know they have to aim for. Taking three points in circumstances which are far from ideal. New signing Mikel Arteta is not under any illusions that the team are playing the champagne football we've been indulged with in recent seasons. "We can improve. I thought that we could have done much better with the ball than we did. I think we weren’t that good with the ball because they were really good at putting pressure on. "We need to settle in as quickly as possible. Most of the guys came at the last minute so it’s not something that’s going to happen in the first minute but when you’ve got the quality, it makes everything easier. "There are five or six new players coming in and we are going to be an important part of the team. We all need to be together. The manager is really positive about it and we know that we will be fine." And the former Everton player has revealed he chatted with Cesc Fabregas about his move to north London. "I talked to him the day after I signed the contract. He advised me on two or three things and he was really nice to me. "He told me about the areas to live, about the team, about the club, how good they are, about the people at the club. It was really good." For all my disappointment about the way Cesc left the club this summer, he is still a good guy. I'm glad he's tried to helped Arteta adapt to life at Arsenal. It must be a daunting experience for any professional footballer to up sticks and move half way across the country to join a different club. 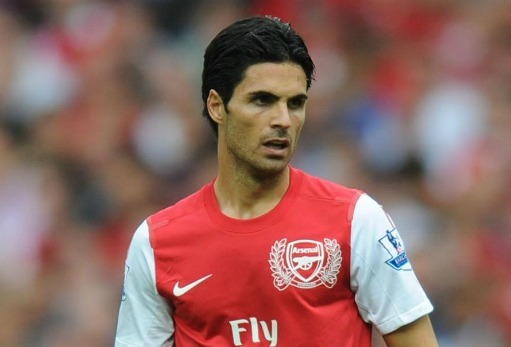 But there is certainly more on offer at Arsenal than there is at Everton for Arteta. I think he's started well enough. We've got a player who know what is expected of him and he's already made a good impression on his team mates. The younger members of the reserve team were made up with his involvement in their training sessions whilst the majority of the first team were on international duty. Long may his influence continue. Another player who will have a growing influence on the team this season will be Yossi Benayoun who has revealed that Arsenal came in for him eight days before the close off the transfer window. And despite what appeared to be a last minute panic signing, the Israel captain said once he knew of Arsene Wenger's interest he jumped at the chance of a switch to north London. "The media thought it was dramatic, but I knew it would go to the last day. There was an agreement between me and Chelsea that we would wait until then because they wanted to bring in another player – either [Raul] Meireles or [Luka] Modric. "I first heard about the interest from Arsenal eight days before the end of the window and when I knew they wanted me it was an easy choice. "I had a few good options from clubs in England and outside but as soon as I heard about Arsenal my mind was made up. "Deadline day was calm for me. I flew in from Israel in the morning, from the national team, and knew it was going to happen." I imagine that one of the reasons for Benayoun's loan deal taking place was the concern over the availability of Jack Wilshere this season. There is concern among the medical staff that he might not return within the time scale set out and that must have forced Arsene Wenger into action. However it is good to see the England international is keeping his fitness up as he's working out in the gym at London Colney with another of our walking wounded, vice captain Thomas Vermaelen as pictured on Twitter the other day. A question was raised the other night at the Arsenal Supporter Trust meeting about the long term future of Ivan Gazidis at the club. We know the Arsenal CEO is in a tough spot right now. He's stuck between Stan Kroenke, Arsene Wenger and the fans with little room to maneuver. It appears from the outside that Kroenke appears happy to leave the club without direction and with the manager's decision not to spend all the cash available to him in the transfer proceeds account causes Gazidis grief with the fans. The South African appears to be on a hiding to nothing. He can't push the club forward and deal with the real issues without Kroenke's say so and the majority shareholder appears content to let Arsenal stagnate for the next few years. Further reading comes in the form of Joss Bennett's new Inside the Formation article on the reasons behind Alex Song's man of the match performance in Germany on Tuesday night.